In a development that might change the political equation at least in three parliamentary constituencies of Assam, AIUDF chief and Lok Sabha MP Badruddin Ajmal has started campaigning for United People’s Party Liberal (UPPL) candidate Urkhao Gwra Brahma. All India United Democratic Front (AIUDF) chief Ajmal while addressing a press conference recently said the party has entered into an understanding with the UPPL to help each other in the Lok Sabha polls. While UPPL is contesting Lok Sabha polls in two parliamentary seats — Kokrajhar and Mangaldai – Ajmal’s AIUDF is contesting from three parliamentary constituencies — Dhubri, Barpeta and Karimganj. While Ajmal can be helpful to Urkhao in securing the Muslim votes in Kokrajhar seat, Bodo community leader Urkhao can influence Bodo voters in Dhubri and Barpeta Lok Sabha constituencies. “We are doing politics for defeating communal forces. We have joined hands with the UPPL so that we can bring an end to the politics of hatred and usher in all-round development in Kokrajhar parliamentary constituency,” Ajmal told the media. Urkhao, who is contesting from Kokrajhar LS constituency, is facing a tough battle from Pramila Rani Brahma, who has been fielded by Bodoland People’s Front (BPF), an ally of ruling BJP in Assam and and sitting MP Naba Kumar Sarania, who has the support of non-Bodo voters. The Kokrajhar seat, which is going to polls in third phase on April 23, has a total of 17, 65,423 electors. While the Bodo voters constitute only four lakh, the non-Bodo communities including Muslims, Bengali, Adivasi, Koch-Rajbongshi and Assamese voters constitute the rest. There are 3, 87,000 Muslim votes and AIUDF has a considerable hold in the area. While Ajmal is expected to help in garnering Muslim votes in Kokrajhar for Urkhao, UPPL will assist AIUDF in Dhubri and Barpeta parliamentary constituencies where there are a sizable Bodo and other tribal population. 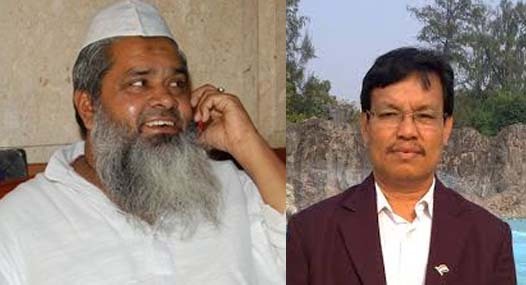 Ajmal is seeking re-election from Dhubri and AIUDF’s Rafiqul Islam is contesting from Barpeta seat while AIUDF’s sitting MP Radheshyam Biswas is seeking re-election from Karimganj. UPPL has fielded Pradip Kr. Daimary as its party candidate for Mangalda parliamentary seat.